I have to admit its been a somewhat flat start to the season for me. A week 1 win for the Skins (just – thanks Alex Barron – cheque is in the post!) followed by two collapses, has me thinking this will be another season of doom and gloom. And then the juiciest matchup in the entire NFL in Week 4 lands on my lap, and praise the lord Sky Sports here in England have selected it as the 4.15pm EST (9.15pm here) live game. Professional dog killer Michael Vick has cemented himself as the number one signal caller in Philly and will be looking to show off his silky running skills and big arm on Sunday. What makes this games so special is not only the fact it is one of the fiercest divisional rivalries in the NFL, both teams have not been able to establish the run, so they will be looking to McNabb and Vick to grab the game by the scruff of its neck. The Eagles for sure have faster, younger and more talented wide receivers, with DeSean Jackson and Jeremy Maclin. In the Burgandy and Gold corner is a bunch of WR that excites me as much as a luke-warm cappuccino from a petrol garage. My prediction – When he was traded earlier this year and asked about returning to Rocky Balboa’s home town McNabb said it ‘would just be another game’ – what a bunch of crap. McNabb will be fired up, but so will the Eagles fans, and so will Philly head coach Any Reid. This game has the potential to be a classic, but the Redskins are simply not worth the hype. Going 14-0 down early to the bottom feeding Rams last week was enough to convince me that Washington will be picking top 12 in the 2011 draft. Hate to say it but I have the Eagles by 10. 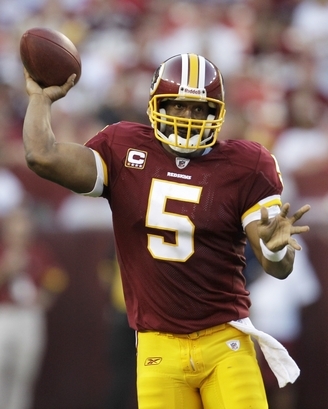 Prediction – Eagles 27-17 Redskins – Vick to pull off a few dizzying scrambles and Trent Cole to get to McNabb twice.